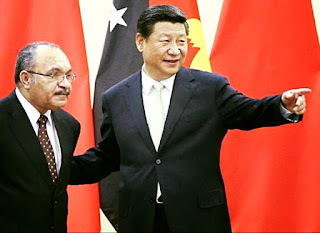 BEIJING –LIU XIN | Global Times: As Papua New Guinea Prime Minister Peter O'Neill visits China, local analysts say well-developed China-Papua New Guinea relations fit the interests of both countries and Australian media should not hype China's threat in the south Pacific region. He said some Australian experts and media are prejudiced against the Belt and Road initiative and negatively hype China's presence in the area. But China is promoting the initiative and launching cooperation with these countries under the principle of equality, coordination and transparency. "China and PNG have strengthened cooperation on infrastructure construction, processing trade and maritime projects recently under the Belt and Road initiative,” said Yu Lei, from the Australian Studies Centre at Beijing Foreign Studies University. “The two sides also share common interests in some key issues, including climate change. "Some countries, especially the US and Australia, are oversensitive and worried about China's increasing presence in the southern Pacific Ocean region since Chinese enterprises have curtailed their dominance in local markets,” Yu said. “They can no longer pressure some countries by loan agreements as many turn to China for help," he said, adding that China's financial assistance is without subsidiary conditions. O'Neill's China trip also comes as Australian foreign affairs minister Julie Bishop said Australia was concerned about Chinese influence in the Pacific, claiming Australia wanted to be the "natural partner of choice" to Pacific nations. Yu said that it is natural to see China's political and economic influence has increased in the area as more cooperation has been launched and it is also normal for China to take part in enlarging some ports in the areas for trade or build satellite observation or scientific stations. "China is not seeking military presence in the area but to better take part in local development and protect its own interests,” he said. “Some countries which hype the China threat in the area only shows that they should learn to get used to the situation."